For 25 years Bill Carney has delivered a box of handmade wooden toys to T.C. Thompson Children's Hospital to be passed out to patients on Christmas. Now he enlists the help of students in his Chattanooga Woodworking Academy. 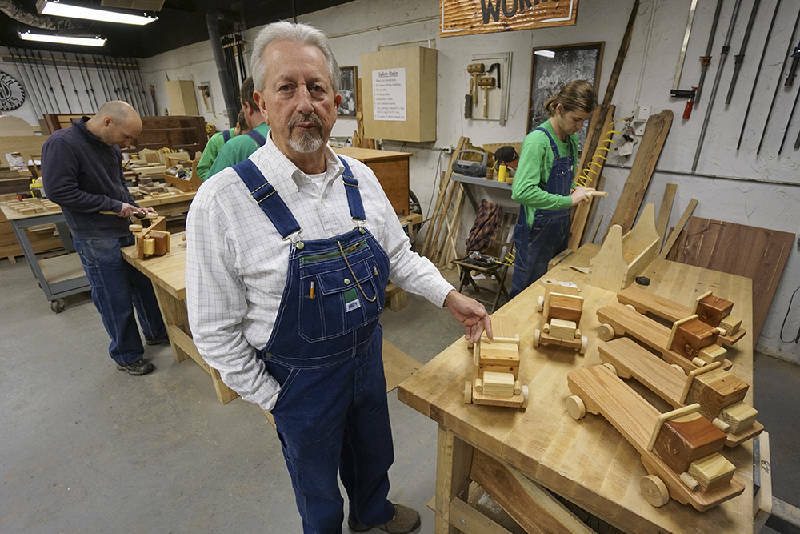 Chattanooga Woodworking Academy is filled with the buzz of saws and scrape of sandpaper 51 weeks of the year as students learn to make cabinets, frame houses and build furniture. But one week before Christmas, the South Market Street business turns into Santa's toy shop when everyone pitches in to build wooden trucks for patients at T.C. Thompson Children's Hospital at Erlanger. Academy director Bill Carney has delivered Christmas boxes of wooden toys for 25 years. Two years ago, he enlisted the academy's students to help his secret Santa cause. As a kid growing up in Knoxville, Curtis Baggett watched his dad ring bells at red kettles for the Salvation Army. Thirty years ago he followed suit. Now his grandchildren are joining him to ring -- the fourth generation of Baggetts manning red kettles. B. Leroy Parks began volunteering in the early 1950s with the group known then as the BellSouth Pioneers; but when a child at Signal Centers tugged his heartstrings, he narrowed his focus to the nonprofit that helps disabled adults and children achieve independence. His community service has inspired his four children to volunteer in their communities as well. A toymaker, bell ringer and handyman -- all working quietly behind the scenes, never seeking praise, but very deserving of it, according to the directors of the nonprofits they serve. Curtis Baggett has been a Salvation Army bellringer for 30 years. His father was a volunteer bellringer for the Salvation Army, setting an example for Baggett, who now rings the same bell his father used. Baggett has started ringing with his grandchildren to continue the family legacy of service. When retired baby boomer Curtis Baggett and wife, Suzy, began talking about the legacy they wanted to leave their children, they realized it was the same life lessons their parents had left them -- and service to others was chief among them. When growing up in Knoxville, Baggett says he knew his Dad rang bells for the Salvation Army at Christmas, but "I didn't pay that much attention to it." The 67-year-old says it wasn't until he saw his father interviewed by a TV station 30 years ago that he understood the motivation to stand in the cold and ring a bell for donations. "Dad said his mother had told him it was more blessed to give than receive, and he was just trying to live up to that. That made an impression on me," recalls Baggett. Following in Dad's footsteps -- and even using his Dad's handbell -- Baggett began ringing for the Salvation Army in Chattanooga. "I ring in his memory. This keeps his memory alive for me," he say. And, while Baggett has retired from his job as director of capital gifts at McCallie School, he's kept his kettle post. Through the years at kettle-side, he has been joined by his wife, his children and, two years ago, his grandchildren. "We usually ring at the food court entrance at Hamilton Place. We thought it would be fun to ring in a place that had a lot of kids coming in and out -- and sure enough that was the trick." Kimberly George, Salvation Army director of marketing and development, says Baggett's service to the agency led to his appointment to the nonprofit's board a decade ago. Like a Pied Piper of bell ringers, Baggett has been successful recruiting his friends to don a red apron and join him. "He organizes three to four days of ringers every Christmas season himself," George says. This month, for instance, Baggett filled four of the nine-hour days. Baggett says the value of community service is "connecting with something that's bigger than I am. It's hard to find something you can really believe in and, once you find it, you should hang onto it." Although Bill Carney has delivered boxes of wooden Christmas toys to sick children at T.C. Thompson Children's Hospital for 25 years, he has yet to see a child receive one. Lois Simpson, T.C. Thompson Child Life director, says Carney just "brings the box by every year, leaves it in the playroom and toddles off." "This sweet, modest man stops by Children's Hospital every December, very quietly with no fanfare, with a big box of toy wooden trucks for Christmas gifts," says Pat Charles, director of corporate communications for T.C. Thompson. "They are very well-made and high quality. He used to make them all by himself, but now he involves his students so they, too, have a chance to give back to the community." Carney is director of Chattanooga Woodworking Academy, a school he started two years ago in a restored 1940s auto shop on South Market Street. His students are there to learn vocational skills and will master building log houses, conventional frame housing, cabinet making, advanced millwork and furniture making by the time they complete the four-year trade school. Last year, the woodworker drafted his students' help in his toy making. They build 18-inch-long trucks with 6-inch-wide beds -- durable enough that kids can ride on them -- out of oak, pine, cherry, cedar or whatever wood happens to be in the shop. "We try to get different-colored wood in each truck so they are interesting. We usually spend the week before Christmas making them and we'll make anywhere from 25 to 50 in a week," Carney says. "I try to schedule time to make them close to Christmas because I find the students get much more involved and more pleasure out of it then," Carney says. "I've never seen one child get his in all these years," he says. "I just prefer to stay in the background." Leroy Parks, left, began volunteering his time for nonprofits in the early 1950s with the BellSouth Pioneers. He has been a volunteer with Signal Centers for more than 30 years. He and his daughter, Celeste Womble, who plays Santa's elf, help distribute gifts at the agency's Christmas parties. B. Leroy Parks began volunteering in the early 1950s with the former BellSouth Pioneers, a community service organization comprised of BellSouth telephone employees. Sixty years later and retired from AT&T after 47 years, Parks is still an active volunteer, but he has narrowed his focus to Signal Centers. "I met this little fellow who was 5 or 6 years old. He was handicapped and he'd had four heart operations," Parks says. "He took up with me because I had all the tools you work with on telephones. He wanted to hold them, asked what they did and I explained what each was used for. I just fell in love with him. I thought right then that, if I could help with anything over there, I was going to help them." And he's done just that for more than 30 years. Signal Centers Executive Director Donna McConnico says Parks has done everything from weeding the playground to planting gardens, painting rooms and cleaning toys. He organized telephone company volunteers to work United Way's Day of Caring; he organized company volunteers whenever he saw a need bigger than a one-man job. "Mr. Parks might drive by the building, see the bushes need trimming, go home and get his clippers and come back to trim the bushes. Nobody asks him, he just does it," she says. Parks says community service is the legacy of his grandmother. "My grandmother raised me, and she always volunteered. I guess that's where I got it because I had to follow her when she volunteered someplace," he says. Parks says he loves the Signal Centers' Christmas parties in particular. He has volunteered at the holiday parties -- designed for adults and children -- in each of the 35 years they have been held, adds McConnico. Park's wife, Doris, to whom he's been married 59 years, volunteers with him. 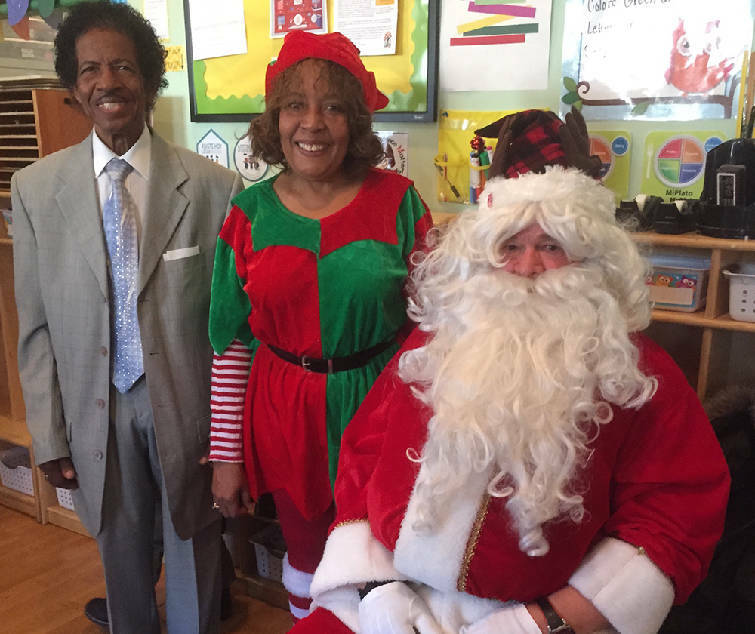 He even convinced his 57-year-old daughter, Celeste Womble, to dress in an elf suit and help Santa distribute gifts. He adds with pride that all of his four children donate time as volunteers for nonprofits in the cities where they live. McConnico says Parks recently was awarded Board Emeritus status by Signal Centers, only the second volunteer to receive the honor in the agency's 40-year history. "In an interview with him, he told me, 'Every day I get up and ask myself what can I do to help somebody else today?' And that's actually what he thinks," says the director. "He's truly an incredible man."